Nanocrystalline ceria was prepared as a support for vanadium oxide catalysts and tested for the oxidative dehydrogenation of propane. Nanocrystalline ceria is very active for the total oxidation of propane under conditions used for oxidative dehydrogenation. The addition of vanadium results in a switch of activity to produce propene with appreciable selectivity. 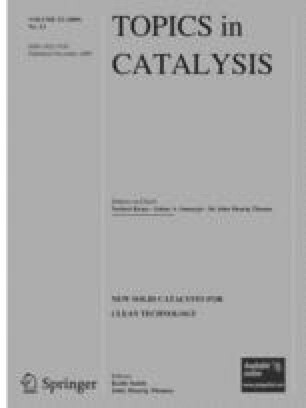 The catalyst performance depends on the vanadium loading. Lower vanadium loadings resulted in catalysts with highly dispersed vanadia species, which were selective towards propene production. Higher vanadium loadings resulted in the formation of a mixed cerium–vanadium phase, which was also active for propane selective oxidation. A catalyst with an intermediate loading was far less selective. Catalysts were characterised by a range of techniques (including XRD, laser Raman, TPR, SEM/EDX and XPS), and the activity of the catalysts can be related to their structure and chemistry. We would like to thank Cardiff University, School of Chemistry and EPSRC for funding.